Black Rock Mine Operations (BRMO) is operated by Assmang and mines manganese ore at the complex situated 80 km northwest of Kuruman in the Kalahari. The Black Rock Project, established in 2010, focuses on developing new mining opportunities at BRMO in order to optimise the output of high-grade manganese ore products. The project further aims to ensure BRMO’s sustainable life that would have valuable implications for the company and its employees, the surrounding communities and the region. The multi-billion rand project is to be executed over a period of six years, and aims to modernise the mine, including underground and surface plant infrastructure, in order for it to mine the manganese resources more cost effectively. Other planned outcomes include creating flexibility to ensure BRMO can react more effectively to changes in market product requirements. • To use technology as an enabler in order to respond to and sustain business-related demands and pressures. • To break down the silo mentality. • To apply modern digital solutions, enabling enhanced decision making and real-time performance management to drive performance excellence. • To standardise business rules and practices. • To integrate various sources of information – from automation, PMIS, electrical and fire detection to asset management systems – in order to provide operational staff with a holistic view of the mine operation’s entire value chain, a centralised view of all KPIs, and one version of the ‘truth’. • To bring about proactive attitude rather than being reactive. • To empower control room operators to make appropriate decisions by providing the right information to the right people at the right time. 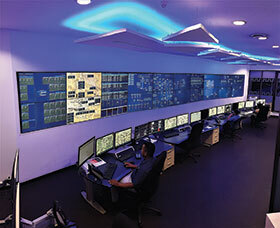 BRMO’s realisation that today’s technology must align to today’s business requirements through modern strategy and the training of staff was the catalyst for the evolution of its Central Control Room (CCR). BRMO’s road to modernisation is supported by core services, such as power, network and datacentre infrastructure to ensure business availability, continuity, and effective data recoverability. It thus comprises a number of enablers, including enhanced networking, the creation of a single, logical metro-cluster datacentre, a high performance processing platform, upgraded virtualisation technology, a complete power management solution and a video wall. Using a strategy for process control systems developed in 2015 with Wonderware SA as the guiding principle, the BRMO PLC/scada specification was drawn up. It also took into consideration the consolidation of the extensive existing Wonderware installed base, as well as the standalone and proprietary scada systems, that were being migrated from a highly fragmented environment into one centralised location. “Prior to the implementation, through various audits across many sites, we realised that there was a gap within our system hierarchy when it came to integration and alignment between the business and process control systems,” adds van Heerden. During the first phase of the project, existing Wonderware System Platform objects and data were used to create an object-based model that was then utilised to define a KPI tree, which accurately represented user requirements. This system was then built in Wonderware System Platform 2017, and connections made to all data sources. Parts of this design included the visual representations that made use of Wonderware Situational Awareness principles, a design approach devoted to providing operators with the most relevant and necessary information at the right time, which included the definition of alert criteria and visualisation, trends, dials and displays of equipment states. The end result was the definition of screen layouts made up of five virtual displays, which provides BRMO with a single view of the entire process. KPIs and equipment of the entire value chain are viewable, rather than just a copy of the scada screens. Given the ability to extrapolate or predict values through projection, the viewer is able to understand the effect of current conditions on future performance. “The new centralised environment and its associated services is regarded as the start of many new opportunities in the future of digital transformation at BRMO,” continues van Heerden, “as it provides an indispensable tool when it comes to enabling better control and decision making. “The centralised control environment is being used as a vehicle to standardise business rules and practices. Controlling, coordinating and reporting from a central environment, results in information that is less biased to a sub-discipline as decisions are based on what is best for the value chain. Only a view on the total value chain can achieve this. The establishment of the CCR and supporting services was instrumental in the change process by improving in-shift reporting, from less than 50 percent to a sustained 90 percent. In addition, the new environment has provided BRMO with access to a richer source of cleansed and validated data, which has allowed for the exponential growth of its business intelligence (BI) capability. In terms of future growth, the solution provides the requisite flexibility and scalability to add sophisticated systems such as fleet management for display and baselining on the video wall. The 4th Industrial Revolution and the New Way of Work through Edge-to-Enterprise solutions.